Who are Jews of Color (JOC)? 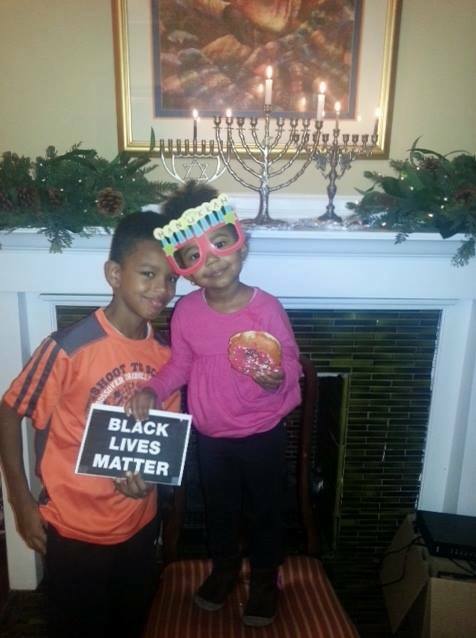 An Inclusive & Diverse Hanukkah Same’ach! Hanukkah (aka Chanukkah) is the Jewish festival of lights and one of the most joyous celebrations of the Judaic calendar, including present-giving, game playing and the consumption of diet-busting delicacies. The miracle of Chanukah is not just about a little bit of oil lasting eight days. It is about the inner healing light within each of us. Chanukah is a time when we can celebrate this inner healing light as we move toward wellness. 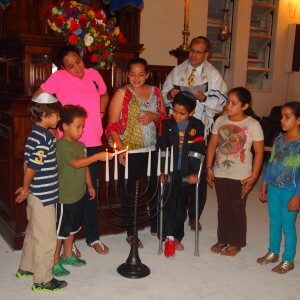 Chanukah is also about the miracle of survival against all odds, about hope, courage and belief in one’s ability to overcome seemingly insurmountable obstacles. For the blessing of well-being and transformation that flows from this season, we light this candle for the health and wellness of our bodies. For the blessing of well-being and transformation that flows from this season, we light this candle for the health and wellness of our minds. For the blessing of well-being and transformation that flows from this season, we light this candle for the health and wellness of our souls. For the blessing of well-being and transformation that flows from this season, we light this candle for the health and wellness of our children. For the blessing of well-being and transformation that flows from this season, we light this candle for the health and wellness of our parents. For the blessing of well-being and transformation that flows from this season, we light this candle for the health and wellness of our communities. For the blessing of well-being and transformation that flows from this season, we light this candle for the restoration of health and wellness to those who are ill, suffering, or grieving. For the blessing of well-being and transformation that flows from this season, we light this candle for the health and wellness of our world. For the blessing of well-being and transformation that flows through the Shekinah, the Source of Healing Wisdom and Inner Light. 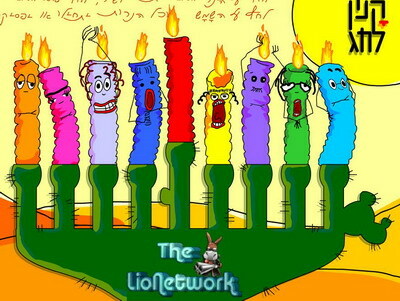 The Best Singin’ & Dancin’ Hanukkah Candles, ever! Click on the picture link, then click on each candle. Select the Shamash (red center candle) to start or stop. Mi yimalel gvurot Yisrael, Otan mi yimne? Who can retell the things that befell us, Who can count them? Redeem itself through deed and sacrifice. NACOEJ Ethiopian Embroidery Program. Stunning craftmanship! …in Germany, the eighth and last night of Chanukah used to be very special. All the leftover wicks and oil were lit in giant bonfires. People sang songs and danced around the fire, often until the small hours of the night. 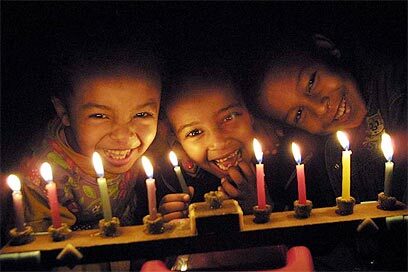 …Turkish Jews make candles from the flax fibers used to wrap the etrog. The remains of these Chanukah candles are then melted together to make another candle used to search for bread crumbs pre-Passover. …If you are an Ashkenazi Jew (of European ancestry) it is traditional for every family member to light a hanukkiah (menorah). If you are a Sephardi (descended from Spain and Portuguese Jews) only the head of the household lights the hanukkiah. In a large bowl, mix together the flour and salt. In a small bowl, dissolve active dry yeast and sugar in one cup of the warm water. Set aside until the mixture becomes foamy, about 5 minutes. Add the yeast mixture to the flour and add 1-3/4 cups water. If the dough is heavy and a bit dry, add remaining water. Dough should be soft and smooth, but no so soft that it seems like batter. Stir the dough until you get a nice, somewhat sticky mixture. Cover the bowl with plastic wrap and let it rise in a warm place for 1 hour. With oiled hands, reach under the dough and bring the bottom to the top and fold over. Repeat 3 to 4 more times until the dough has completely deflated. Cover with plastic wrap and let rise again until doubled, about 30 to 45 minutes. Heavily flour a work surface. Flour your hands well and pull off a small handful of dough and squeeze it in your hand to get a single small ball of dough the size of a golf ball. Toss the ball in the flour and using your thumb, poke a hole all the way through the dough ball. Stretch the ball into a doughnut shape, about 3-1/2-inches wide. Lay on the floured surface and repeat with remaining dough. In a heavy skillet, heat 2 inches of canola oil to 350 degrees over medium-high heat. Working in batches of 4 to 6 doughnuts (depending on the size of your skillet), gently slide doughnuts into the oil, being careful not to splash. Fry until golden brown, about 2 minutes each side. Transfer doughnuts to a plate lined with a paper towel, and allow to drain and cool slightly. Drizzle lightly with honey before serving. 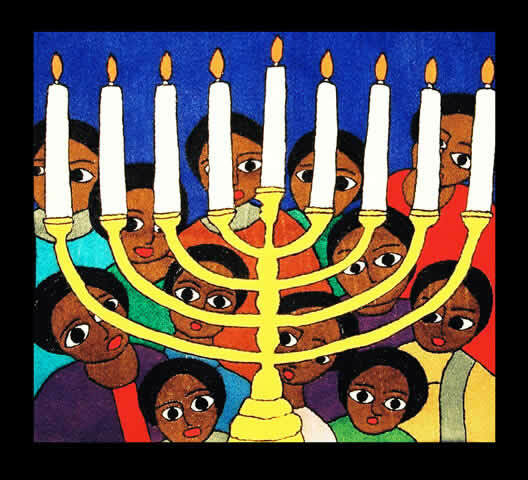 The story of the Maccabees still speak to us today, lighting our homes with faith and filling our hearts with pride. NEVER AGAIN Must Remain More Than A Mere Slogan! 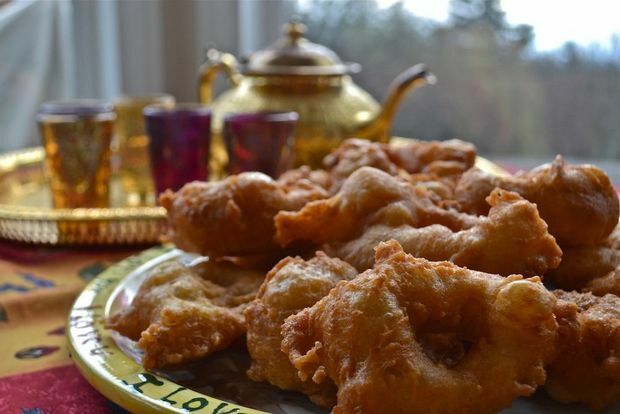 Multicultural Passover Traditions from Around the World!